Serving: Boston Massachusettes and the surrounding area. Santa JG is Boston’s true Father Christmas. Give Santa JG a chance to bring cheer to your holiday event or party. 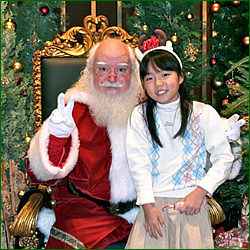 This Santa, is great for corporate gatherings, tree lightings, parades, home visits, and more. Santa JG is famous via national entertainment gigs, educational and television events, even on NPR broadcast. Contact Santa Jonathan Meath today!